ICE released its most comprehensive immigration detention data yet. It's alarming. Here is what we’ve learned from it, and a link for you to study the data yourself. The Department of Homeland Security (DHS) is notoriously obscure about the systems it uses to detain immigrants in the United States. Without a court order, it is rare that DHS’s Immigration and Customs Enforcement (ICE) divulges any details about where its jails and prisons are located, who or how many people are held there, or any details about how they are managed — including how much taxpayers spend to keep them open, and who gets that money. NIJC’s Transparency Project has detailed this lack of accountability in numerous reports, most recently in ICE Lies, where we teamed up with the Detention Watch Network to show how DHS's patterns of irresponsible governance— including fiscal mismanagement and secrecy in its detention operations — contribute to a failure of accountability for ongoing human rights violations. Last month, the DHS Office of Inspector General released a report finding that ICE violated federal procurement laws in 2014 when it signed, and in 2016 extended, a contract for more than $1 billion with private prison company Core Civic (formerly Corrections Corporation of America, or CCA) to build and operate the South Texas Family Residential Detention Center via a pass-through Inter-Governmental Service Agreement with the City of Eloy, Arizona. This lack of transparency has become an issue in Congress’s federal budget negotiations, with advocates and a growing number of senators and representatives calling for appropriators to cut ICE’s funding. In the past several months, ICE has released some facility information in response to Freedom of Information Act requests. Most recently, the Immigrant Legal Resource Center obtained an extensive and detailed list of DHS facilities in response to a FOIA request it filed as part of its research on sanctuary cities. This list contains a relative trove of information about how immigration detention is currently operating in the United States. About the data: The set of 10 lists includes data on types of contracts, demographics, medical care providers, and inspections history for more than 1,000 federal facilities that detain immigrants, including county jails, Bureau of Prisons facilities, Office of Refugee Resettlement centers, hospitals, and hotels (more on those down below). Customs and Border Patrol facilities are not included in the data. DHS compiled the data between November 4 and 6, 2017 — about one month into fiscal year (FY) 2018. In November 2017, ICE reported that its total average daily population for FY 2018 was 39,322 people. This marks the second year in a row the U.S. government hit an unprecedented high in how many immigrants it incarcerates. ICE currently has nine facilities available to detain juveniles, with approximately six of those limited to under 72 hours. These are neither family detention centers nor Office of Refugee Resettlement children’s shelters; instead, ICE contracts with juvenile jails to hold children under 18 separate from adults, including their family members. The facilities used to jail children for longer than 72 hours are the Northern Oregon Juvenile Detention facility in The Dalles, Oregon; the Abraxas Academy Detention Center in Morgantown, Pennsylvania; and the Cowlitz County Juvenile facility in Longview, Washington. While the average detention population for these facilities is only one to three children, the average length of stay for a juvenile detained in one of the three facilities ranges from 100 to 240 days. This means that in recent years ICE has detained dozens of children in juvenile jails for many months on end, in remote locations far from family and any accessible legal representation. ICE reports that an average of 71 percent of people detained on a given day were subject to “mandatory detention” in the first month of FY 2018 (the only period for which this data was provided). An average of 51 percent of the daily population that month were marked as “non-criminal,” and 51 percent also were classified as posing “no threat.” Twenty-three percent were classified as the lowest “Level 1” threat, which typically includes people with low-level and nonviolent criminal convictions. Only 15 percent were classified at the highest threat level. 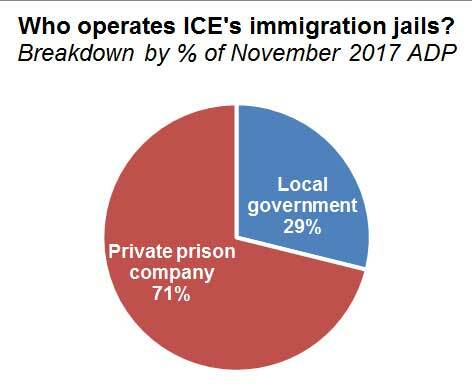 On an average day in November 2017, most people in ICE custody were in prisons operated by private companies. About 71 percent of the average daily population that month were held in privately operated jails. An average of more than 15,000 people daily were held in 33 jails where local governments signed contracts with the federal government (known as Inter-Governmental Service Agreements or U.S. Marshal Service Intergovernmental Agreements) and then subcontracted facility operations to private, for-profit companies. 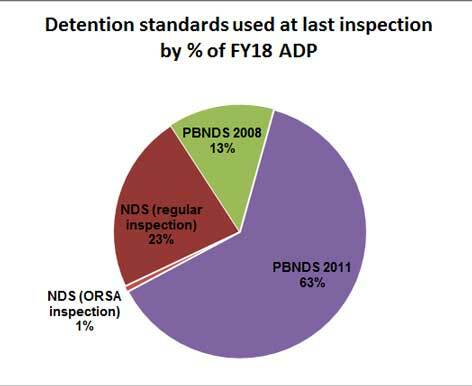 Only 65 percent of ICE's adult detention centers are contractually bound by one of the agency’s three sets of detention standards - known as the 2000 National Detention Standards (NDS), 2008 Performance-Based National Detention Standards (PBNDS), and 2011 PBNDS. 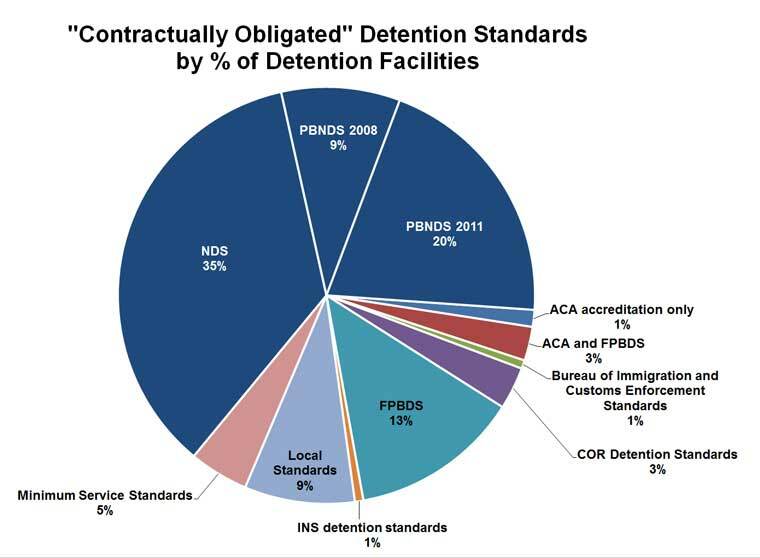 About 14 percent of detained immigrants — an average of 5,000 people a day — are held in facilities contracted under other standards including American Correctional Association accreditation guidelines, the Department of Justice’s 2000 Federal Performance-Based Detention Standards (FPBDS) for federal prisons, and standards created by Immigration and Naturalization Service (INS), the agency that predated ICE. Some contracts only bind jail operators to the vaguely worded “minimum service standards,” “local standards,” or to “COR Detention Standards” which refer to the Contracting Officer Representative and pertain to enforcement of the technical aspects of a facility’s contract rather than conditions inside the jail. 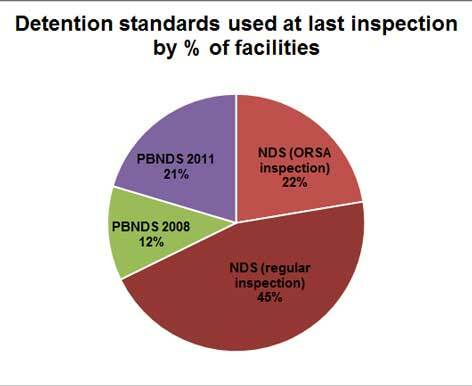 The new data set also includes a list of 13 facilities classified as “use prohibited,” most of which are noted as having failed two consecutive inspections in 2008 and 2009, just before the appropriations law took effect. According to ICE’s list, some of these facilities still occasionally hold a small number of individuals. If you have questions, or spot an error in our analysis, contact NIJC via the press room. Tara Tidwell Cullen is NIJC's director of communications. *Correction: An earlier version of this post stated that 22 percent of immigrants were held in jails permitted to conduct their own unregulated “self-assessment” for their last inspections. It has been updated to reflect that 22 percent of immigration jails were permitted to conduct these types of inspections.